According to historical evidence, the kohlapuri chappals were first worn in the early 13th century and originated in the state of Maharashtra. They were initially known as ‘Kapashi’, Pie-taan’, Kachkadi’, Bakkalnali’, and Pukari, since these were the names of the various villages where the chappals were made and hand crafted. The royal family of Maharashtra ‘Saudagars’ were the first ones to discover the uniqueness of the kohlapuri chappals and lent their creativity to what is today known as the kohlapuri chappal. The Saudagars created a thinner version of the chappal, which had two flaps on either side. They named it ‘Kanwali’, which literally meant a chappal with ears! The Chappals had a little decorative fur like ball in the centre which gave it a royal and elaborate appeal. In the later years, these chappals were discovered by one of Bombay’s prominent shoe retailers J.J and Sons, who ordered 20 pairs from the Saudagar family and sold it in Bombay. Since the Kohlpauri chappals gained immense popularity, there was no turning back, and several craftsmen, who were mainly from the city of Athani in Maharashtra, mastered this art, but since the actual origin of these chappals was supposed to be kept secret, the name given to these chappals was that of Kohlapur. There are several craftsman and places in kohlapur who are masters of this craft as well, but the actual craftsman were from the Athani village. Originally, the Kohlapuri chappal was made using Buffalo-hide, and thread, and the sole was enormously thick which made the chappals weigh up to 2 kilos! The purpose of making such thick chappals was so that the wearer could endure the heat and the mountainous terrains of Maharashtra. These days however, the kohlapuri chappals are as light as a feather and have a thin and flat sole. The chappals are made from fine quality leather, and come in different styles, colors and designs. The traditional kohlapuri chappals come in a tan brown color, with intricate thread designs woven onto the flap, with a bright red fur ball placed in the center. However, with the passage of time these chappals have gone through various new designs and styles, each made for people with different preferences. These days one can find kohlapuri chappals in all sorts of colors ranging from green, red, pink, gold, silver, purple, blue, yellow, black, orange; the list is endless. Certain twists in the basic design are also available, with double-sided flaps, or extra embellishments such assequins, pearls, or stones, which make the kohlapuri chappal suitable for more elaborate events such as weddings, parties, engagements, and religious occasions. Kohlapuri chappals basically come with a flat sole, however with recent innovations in Indian fashion, one can also find kohlapuri chappals with heels which add more glamor to this unique footwear. Geometric patterns and funky designs have also been incorporated in the traditional kohlapuri chappals which make them a must-have for any young college girl. The price range for these chappals varies depending on the store or the retailer. 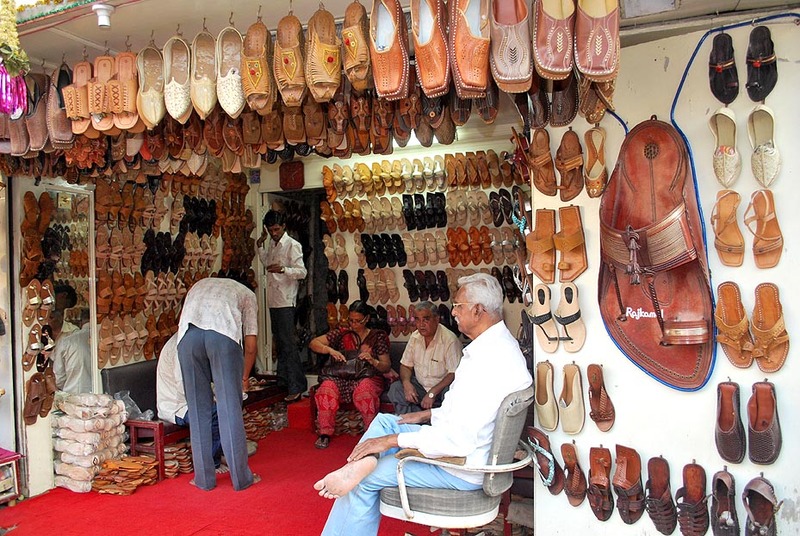 One can find inexpensive kohlapuri chappals in local street markets, while the more expensive kind is available at high-end handicraft stores. These chappals are also available online on different shopping sites and can be delivered anywhere in the world. A unique thing about these chappals is that they are unisex, and can be worn by men as well. The kohlapuri chappals add instant traditional and ethnic appeal to any ensemble, whether it’s a simple kurta, sari, or a lehenga. They are mostly worn for casual attire, but the more elaborate kind can be worn for occasions that require more pomp. For any person who visits India, kohlapuri chappals are always on top of the list of ‘thing to buy’. Their stylish, ethnic, and comfortable quality have made them popular amongst several people in India and in western countries such as America, U.K, Canada, Europe, Middle East, and in other Asian countries as well like Pakistan and China.